A COUPLET is a pair of lines in formal poetry. Here, COUPLET signifies the “coupling” of two things: poetry and music. When the series was created, Poet, Leah Umansky and Carlos Rey Sebastián, DJ Ceremony, bonded and became friends over a joint love for Britpop, Glam Rock and New Wave music. In developing a reading series, they “coupled” their two loves: poetry and music. COUPLET strives to curate events that “couple,” or bring together, both emerging and established poets. Leah Umansky founded it, along with Co-Producer, DJ Ceremony and are still running it. Mostly poetry, and sometimes other lyrical writing. A typical reading begins with 2-3 readers, follows with a short intermission and DJ set, and then rounds up with the final 2 readers. The series concludes with DJ after-party. 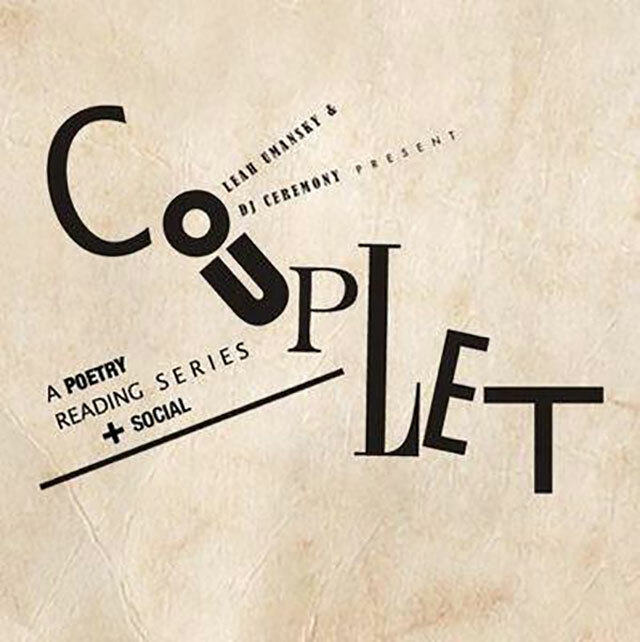 COUPLET is a quarterly reading series and we perform 3-4 times a year, and our summer event occurs as part of the New York City Poetry Festival. October 3rd, 2015 will be our 4th anniversary. Either at our Facebook page, or tumblr, or our twitter account. We also use the hashtag #coupletnyc on twitter and Instagram. It’s a combination. We have a waiting list of readers who have been either solicited by Leah, or have queried about reading. Readers can also contact Leah at Ladybronte@aol.com. Yes, we had two specific goals and have been consistent with both. 1. The first goal was to combine both emerging and established poets. We wanted to create a space for both poets who have published poems, chapbooks, books, and who have advanced degrees in poetry, and welcome poets who are first entering the literary community. We do not discriminate readers based on their publication history. We wanted to create a series that would inform the audience about the poetry world and a series that would enhance the literary community in NYC. 2. The second goal was to make poetry fun and break down the stigmas that surround poetry for non-writers by creating a series that is thought-provoking, exciting and fun. What distinguishes us from other series is the blend of poets we curate for each reading, and of course, our DJ after-party. Every event features music & after-party by DJ Ceremony. Dancing and poetry! What more could one ask for? The next COUPLET reading is scheduled for Saturday, October 3, 2015 at The Delancey and features Wesley Rothman, Susan Bruce, Sandra Beasley, Robin Beth Schaer, and Barbara Ungar.